With easy rolling point breaks, wedgy swells and both left and right peaks, the Monterey Bay coastline is a popular destination for surfing. Coastline coves and notches serve up year-round swaths of beach and waves for beginners and veteran surfers alike. The Monterey Bay surf can be powerful. Be sure and ask a local who may point novice riders towards more gentle waves. Advanced riders flock to areas from Lovers Point to Big Sur while the shallow waters near Del Monte Beach are ideal for rookie shortboarders. Asilomar Beach has consistent breaks but should only be surged when waves are less than waist high and riptides and submerged rocks should be noted. Another intermediate-to-advanced beach is Carmel Beach. The area is well protected from the open ocean, but the riptides can be extremely dangerous. Surf here only when waves are less than waist-high. 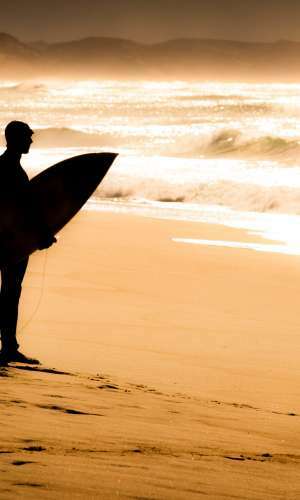 Other popular beaches for surfing include local favorites Marina State Beach, Moss Landing and the beach at Andrew Molera State Park in Big Sur. Monterey&apos;s climate is mild throughout the year, and Monterey Bay&apos;s waters are chilly year-round so pack a wet suit if you plan on staying in the water for more than an hour.